LANCASTER – What should you do if you are attacked? Dozens of women learned the answer to that question at a Women’s Self Defense Seminar this past Saturday. 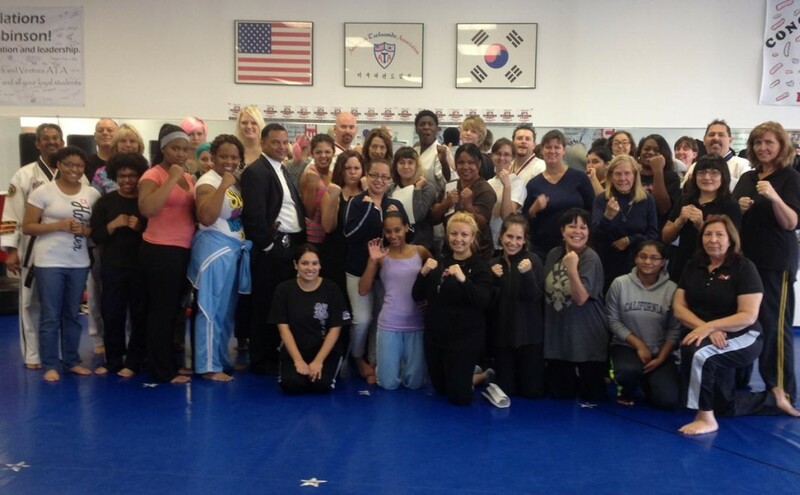 The free two-hour event was hosted by Taekwondo Master William Robinson and Los Angeles Police Detective Mark Pursel at ATA Martial Arts in Lancaster. Attendees received hands-on experience on how to react in life-threatening situations. Robinson advocated the “stun and run” method — make plenty of noise while striking your attacker in a vulnerable area (i.e. palm heel to the nose, knee to the groin, hammer fist to the neck, etc.) and then immediately flee the area for help. Pursel led an interactive discussion on holiday safety, which included tips for safe shopping, driving, using ATMs, and attending and hosting parties. Read the full list of holiday safety tips here. 1 comment for "Holiday Safety: Better safe than sorry…"
Looks like there was a great turnout. Sorry I missed it. Any chance there will be a do over?